Although the Second World War ended sixty years ago, there are still untold stories waiting to be heard: stories not only of diplomats and soldiers but also of refugees, camp inmates and ordinary people living in occupied territories, stories of women's and children's lives as well as those of men. In Hard Labour the forgotten voices of a group of young women who left Latvia in 1944 are captured, telling the story of their flight from the advancing Soviet Army, their difficult journeys across central Europe, their lives as displaced people in Allied camps in Germany and finally their refuge in Britain. Hard work is at the centre of these stories, as the women became 'volunteer' workers, first for the Nazi war effort and then as labourers in the British post-war reconstruction plan. In what has been described as a 'venemous postscript' to the War, the fit and able amongst the vast homeless and often stateless population that fetched up in camps run by the Allies in war-devastated Germany were recruited by western states as labourers. Great Britain was the first nation to recruit displaced persons, offering jobs in hospitals and private homes as domestic workers and in the textile industry to young single women (and later men) from Latvia, Lithuania and Estonia, and other once independent states. Many of these women spent the rest of their lives in Britain, longing to return to their homelands but independence came too late for many of them. 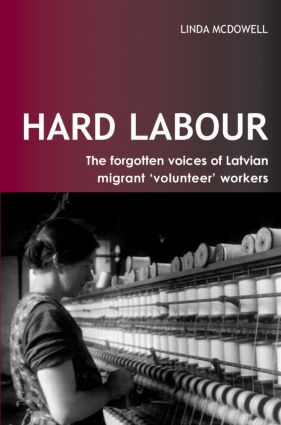 At the centre of Hard Labour are the lives of twenty-five now elderly Latvia women who came to Britain between 1946 and 1949. Their memories are placed in the context of recent work in feminist history, illuminating debates about displacement and loss as well as the transformation of women's lives in post-war Britain.